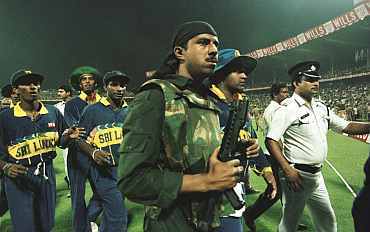 Former India batsman Vinod Kambli has raised suspicion on the 1996 World Cup semi-final between India and Sri Lanka, saying he found "something amiss" in the game. He claimed his doubt arose from skipper Mohammad Azharuddin's decision to field first even though it was unanimously decided that the team would bat after winning the toss. He said he was shocked when he came to know that the team had to field when everybody was mentally prepared to bat. "I will never forget the 1996 match because my career ended after this and I was dropped from the team. I was stunned by India's decision to field. Something was definitely amiss. However, I was not given a chance to speak and was dropped soon after. Our team manager at that time, Ajit Wadekar, was aware of everything," he added. "In the team meeting before the match it was decided that India would field in the event of winning the toss. The decision was taken after consultation with the entire team," Wadekar insisted. Azharuddin too refuted the claims, saying Kambli "must have been sleeping when the decision to bowl was taken". "We wanted to chase after we lost to Sri Lanka in Kotla in the previous match," he added. Sri Lanka beat India in the first semi-final at the Eden Gardens. Chasing a total of 251 for 8, the hosts slumped to 120 for 8 in the 35th over and that led to crowd disturbance. The players left the field for 20 minutes hoping that the crowd would cool off. When the players returned for play, more bottles were thrown on to the field, forcing match referee Clive Lloyd to award the match to Sri Lanka. Sri Lanka, put in to bat after losing the toss, had a disastrous start, losing their dependable opening pair of Sanath Jayasuriya, who later emerged player of the tournament, and Romesh Kaluwitharana with just one run on the board (1 for 2). Both fell to successive deliveries in the day's first over, caught by third man, slashing at pacer Javagal Srinath. Soon Asanka Gurusinha was out and Sri Lanka were reduced to 35 for 3. But Aravinda de Silva stood firm, and in the company of Roshan Mahanama took on the Indian bowling before departing for a well-made 66 off 47 balls. At 85 for 4, the Indians were in still in command, but Arjuna Ranatunga and Mahanama steadied the innings. The Lankans cruised along, but with Ranatunga falling at 168 (for 5) and Mahanama retiring hurt on 58 in the 38th over, they were reduced to 182 for 5. Some lusty hitting by Chaminda Vaas and Hashan Tillakaratne enabled them amass what looked a healthy 251 for 8 in their 50 overs. In reply, India lost Navjot Singh Sidhu (3 off 8 balls) early (8 for 1), but Sachin Tendulkar and Sanjay Manjrekar steadied the innings. At the 20-over mark they were well-placed 83 for 1. Unfortunately, for India, skipper Ranatunga decided to introduce Jayasuriya's left-arm spin. Bowling over the wicket into the rough outside the leg stump, Jayasuriya had Tendulkar (65 off 88 balls) stumped by wicketkeeper Romesh Kaluwitharana, as Tendulkar left his ground after the ball had deflected off his pads. Then India's batting fell apart. The ball began to grip and turn. It made many in the over 100,000 crowd wonder why the home team did not elect to bat. 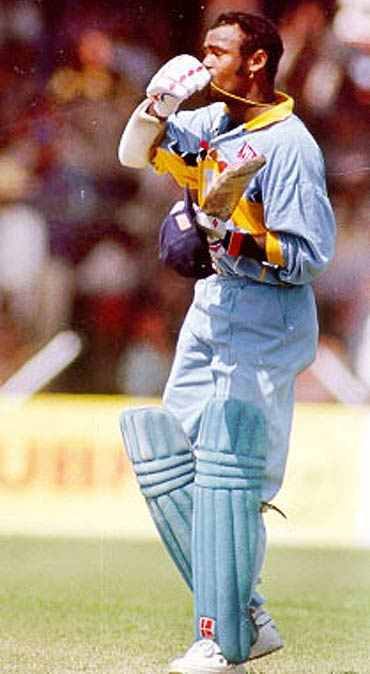 Skipper Mohammad Azharuddin (0 off 6 balls), Manjrekar (25 off 48), Javagal Srinath (6 off 6) and Ajay Jadeja (0 off 11) all were out in the space of seven overs (115-6), the latter's wicket being Jayasuriya's third of the match. Six wickets fells for 22 runs. India were unable to recover. Nayan Mongia (1 off 8) and Ashish Kapoor (0 off 1) were out cheapls, the latter without scoring, and India were reduced to 120-8 in the 34th over. Vinod Kambli was left unbeaten on 10 off 29 balls with Anil Kumble yet to open his account. 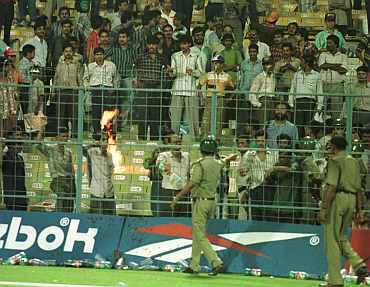 At the fall of the eighth Indian wicket, sections of the crowd vented their disgust with the home side's spinless batting by setting fire to a section of the stands at the Eden Gardens and throwing fruit and water bottles on to the field. The match was briefly stopped, and when play was about to resume, bottles were again hurled at the deep fielders. Match referee Clive Lloyd had no option but call off play and award the match Sri Lanka by default. Kambli left the ground in tears. Poignant images of him crying are still etched in Indian cricket fans' minds. 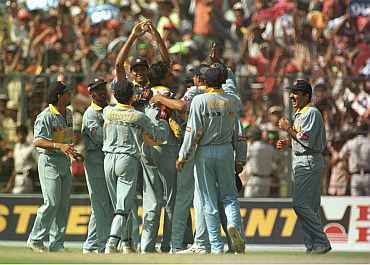 Bowling: Srinath 7-1-34-3, Kumble 10-0-51-1, Prasad 8-0-50-1, Kapoor 10-0-40-0, Jadeja 5-0-31-0, Tendulkar 10-1-34-2. Fall of wicket: 1-8, 2-98, 3-99, 4-101, 5-110, 6-115, 7-120, 8-120. Bowling: Wickremasinghe 5-0-24-0, Vaas 6-1-23-1, Muralitharan 7.1-0-29-1, Dharmasena 7-0-24-1, Jayasuriya 7- 1-12-3, De Silva 2-0-3-1. Umpires: S G Dunne and C J Mitchley.